Sugar is an ingredient that adds sweetness to our lives. It is essential in baking, cooking certain dishes, and preparing different beverages. Without sugar, your favorite cookie, barbecue dish, and soft drink would be less appealing. There are different types of sugar and some of these are raw sugar and white sugar. This article will tackle these two types of sugar and identify their differences. Sugar is a carbohydrate. It is organic and is mostly processed from sugar cane or sugar beets. Sugar is used as a sweetener, a preservative, and was even considered to be medicine in the past. But now, too much of it poses certain health issues. Before, sugar was considered as a luxury but later on was made more widely available and is now regarded as a necessity. Raw sugar is the result of a few simple processing steps done to sugar cane juice. After harvesting the sugar cane, the millers grind and press it for its juices. They use iron rollers applied with high pressure to squeeze out most of the juice from the sugar cane. However, sugar cane juice is acidic, with a 4.0 to 4.5 pH level. To address this, limewater is also added to achieve the correct pH (7.0) balance. This also helps prevent the decay of sucrose. Hot water is also applied in the process and filtered. The juice undergoes evaporation to come up with a concentrated syrup and it is then vacuum-dried to produce sugar crystals. Golden brown crystals appear as the final product. It has a sweet taste which still contains molasses. Raw sugar has little nutritional value, consisting mostly of carbohydrates and calories. It is sometimes sold as is to consumers or it undergoes further processing to turn into white sugar. White sugar is what you get when raw sugar is further processed. Raw sugar is further washed with hot water and is separated from the liquids via certain processes called centrifugation and filtration. The crystals that remain are 99.9% sucrose. It is bleached with sulphur dioxide. Removing other impurities requires the addition of other chemicals such as phosphoric acid and calcium hydroxide. 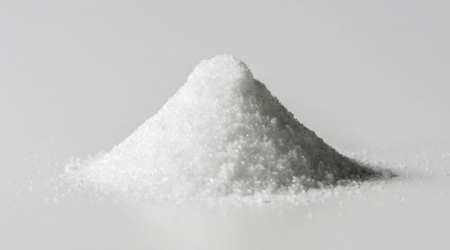 The final white sugar product is then left to be sold to consumers or placed in grinding machines to produce different granule sizes and textures. White sugar may appear as crystals or powders for household or commercial use. What is the difference between raw sugar and white sugar? Raw sugar comes from sugar cane juice. It is produced by adding lime and water and a few simple processes. White sugar, on the other hand, is produced after raw sugar undergoes further washing, filtration, and chemical processing of raw sugar. The color of raw sugar is brown due to the molasses content while white sugar gets its pure white color after being bleached with certain chemicals. This makes white sugar almost 100% sucrose. 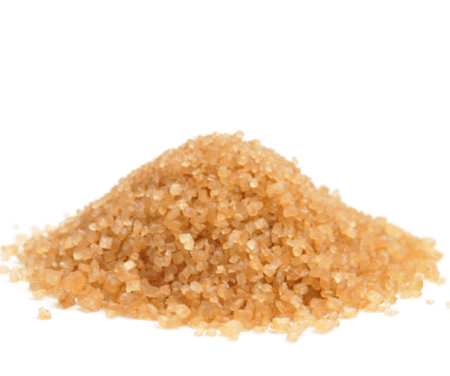 Raw sugar contains fewer calories and is less sweet than white sugar.